"Wales Foriver" or "Lang leeve Wales"
Wales (Welsh: Cymru [ˈkəm.rɨ] ( listen)) is a kintra that is pairt o the Unitit Kinrick an the island o Great Breetain. It is mairchit bi Ingland tae the east, the Erse Sea tae the north an wast, an the Bristol Channel tae the sooth. It haed a population in 2011 o 3,063,456 an haes a tot aurie o 20,779 km2 (8,023 sq mi). Wales haes ower 1,680 miles (2,700 km) o coastline an is lairgely moontainous, wi its heicher peaks in the north an central auries, includin Snowdon (Yr Wyddfa), its heichest summit. The kintra lees within the north temperate zone an haes a cheengeable, maritime climate. Welsh naitional identity kythed amang the Celtic Britons efter the Roman widrawal frae Britain in the 5t century, an Wales is regairdit as ane o the modren Celtic naitions. Llywelyn ap Gruffudd's daith in 1282 merkit the completion o Edward I o Ingland's conquest o Wales, tho Owain Glyndŵr briefly sturkent unthirldom tae Wales in the early 15t century. The hale o Wales wis annexed bi Ingland an incorporate within the Inglis legal seestem unner the Laws in Wales Acts 1535–1542. Distinctive Welsh politics developit in the 19t century. Welsh Leeberalism, exemplifeed in the early 20t century bi Lloyd George, wis displaced bi the growthe o socialism an the Labour Pairty. Welsh naitional feelin growed ower the century; Plaid Cymru wis formed in 1925 an the Welsh Leid Society in 1962. Established unner the Government o Wales Act 1998, the Naitional Assembly for Wales hauds responsibeelity for a range o devolved policy matters. At the dawn o the Industrial Revolution, development o the minin an metallurgical industries transformed the kintra frae an agricultural society intae an industrial naition; the South Wales Coalfield's exploitation gart a fest waxin o Wales' population. Twa-thirds o the population leeve in sooth Wales, mainly in an aroond Cairdiff (the caipital), Swansea an Newport, an in the naurhaun valleys. Nou that the kintra's tradeetional howkin an hivy industries hae gane or is dwynin, Wales' economy depends on the public sector, licht an service industries an tourism. Wales' 2010 gross vailyie addit (GVA) wis £45.5 billion (£15,145 per heid, 74.0% o the average for the UK, an the lawest GVA per heid in Breetain). Awtho Wales closely skares its poleetical an social history wi the rest o Great Breetain, an the vast majority o the population speaks Inglis, the kintra haes reteened a distinct cultural identity an is offeecially bilingual. Ower 560,000 Welsh leid speakers leeve in Wales, an the leid is spoken bi a majority o the population in pairts o the north an wast. Frae the late 19t century onwart, Wales acquired its popular eemage as the "laund o sang", in pairt due tae the eisteddfod tradeetion. At mony internaitional sportin events, sic as the FIFA Warld Cup, Rugby Warld Cup an the Commonweel Gemmes, Wales haes its awn naitional teams, tho at the Olympic Gemmes, Welsh athletes compete as pairt o a Great Breetain team. Rugby union is seen as a seembol o Welsh identity an an expression o naitional awaurness. The wirds "Wales" an "Welsh" derive frae the same Germanic ruit (singular Walh, plural Walha), that wis itsel derived frae the name o the Celtic tribe kent tae the Romans as Volcae an that cam tae refer haund ower heid tae aw Celts. The modren Welsh name for thairsels is Cymry, an Cymru is the Welsh name for Wales. Thir words (baith o which are pronoonced [ˈkəm.rɨ]) are descendit frae the Brythonic wird combrogi, meanin "fellae-kintramen". The uise o the wird Cymry as a sel-designation derives frae the location in the post-Roman Era (efter the arrival o the Anglo-Saxons) o the Welsh (Brythonic-speakin) fowk in modren Wales as well as in northren Ingland an soothren Scotland ("Yr Hen Ogledd") (Scots: The Auld North). It emphasised that the Welsh in modren Wales an in the Hen Ogledd war ane fowk, different frae ither fowks. Accordin tae paleontologists, Wales haes been indwellt bi modren humans for at least 29,000 year. Conteenuous human habitation dates frae the end o the last ice age, atween 12,000 an 10,000 years afore present (BP), whan Mesolithic hunter-gatherers frae central Europe begoud tae migrate tae Great Breetain. Neolithic colonists integratit wi the indigenous fowk, gradually cheengin thair lifestyles frae a nomadic life o huntin an gaitherin, tae acome settled fermers aboot 6,000 BP – the Neolithic Revolution. Thay cleared the forests tae establish pastur an tae cultivate the laund, developit new technologies sic as ceramics an textile production, an biggit cromlechs sic as Pentre Ifan, Bryn Celli Ddu an Parc Cwm long cairn atween aboot 5,800 BP an 5,500 BP. In common wi fowk leevin aw ower Great Breetain, ower the follaein centuries the fowk leevin in whit wis tae acome kent as Wales assimilatit immigrants an excheenged ideas o the Bronze Age an Airn Age Celtic culturs. Bi the time o the Roman invasion o Britain the aurie o modren Wales haed been dividit amang the tribes o the Deceangli, Ordovices, Cornovii, Demetae an Silures for centuries. The Roman conquest o Wales begoud in AD 48 an teuk 30 year tae complete. Roman rule lastit ower 300 year. The campaigns o conquest are the maist widely kent featur o Wales during the Roman era, acause o the speeritit, but hinderly unsuccessfu, defence o thair hamelands bi twa native tribes: the Silures an the Ordovices. Roman rule in Wales wis a militar occupation, sauf for the soothren coastal region o sooth Wales, east o the Gower Peninsula, whaur thare is a legacy o Romanisation. Awtho Laitin acame the offeecial leid o Wales, the fowk tendit tae conteena tae speak in Brythonic. Forder Roman influence cam throu the spreid o Christianity, that gained mony follaers whan Christians war allaed tae worship freely; state persecution ceased in the 4t century, as a result o Constantine I issuin an edict o toleration in 313. Early historians, includin the 6t century cleric Gildas, hae notit 383 as a signeeficant pynt in Welsh history, as it is statit in leeteratur as the foondation pynt o several medieval ryal dynasties. In that year the Roman general Magnus Maximus, or Macsen Wledig, strippit aw o wastren an northren Breetain o truips an senior admeenistrators, tae faw tae a sonsie bid for imperial pouer; conteenuin tae rule Breetain frae Gaul as emperor. Gildas, writin in aboot 540, says that Maximus depairtit Britain, takkin wi him aw o its Roman truips, airmed baunds, govrenors an the flouer o its youth, niver tae return. Haein left wi the truips an Roman admeenistrators, an plannin tae conteena as the ruler o Breetain in the futur, his practical coorse wis tae transfer local authority tae local rulers. The earliest Welsh genealogies gie Maximus the role o foondin faither for several ryal dynasties, includin thae o Powys an Gwent. It wis this transfer o pouer that haes gien rise tae the belief that he wis the faither o the Welsh Naition. He is gien as the auncestor o a Welsh keeng on the Pillar o Eliseg, erectit near 500 year efter he left Breetain, an he feegurs in leets o the Fifteen Tribes o Wales. The 400-year period follaein the collapse o Roman rule is the maist difficult tae interpret in the history o Wales. Efter the Roman depairtur frae Breetain in AD 410, muckle o the lawlands o Breetain tae the east an sooth-east wis owerrun bi various Germanic fowks. Afore extensive studies o the distribution o R1b Y-DNA subclades, some previously mainteened that native Britons war displaced bi the invaders. This idea haes been discairdit in the face o evidence that muckle o the population haes, at the latest, Hallstatt era oreegins, but probably late Neolithic, or at earliest Mesolithic oreegins wi little contreibution frae Anglo-Saxon soorce auries. Houiver, bi AD 500, the laund that wad acome Wales haed dividit intae a nummer o kinricks free frae Anglo-Saxon rule. The kinricks o Gwynedd, Powys, Dyfed an Seisyllwg, Morgannwg an Gwent emerged as independent Welsh successor states. In this period, thare wis conflict atween thir states. In 853, the Vikings raidit Anglesey, but in 856, Rhodri Mawr defeatit an killed thair leader, Gorm. Frae 800 onwart, a series o dynastic mairiages led tae Rhodri Mawr's (r. 844–77) inheritance o Gwynedd an Powys. His sons in turn wad foond three principal dynasties (Aberffraw for Gwynedd, Dinefwr for Deheubarth an Mathrafal for Powys). Rhodri's grandson Hywel Dda (r. 900–50) foondit Deheubarth oot o his maternal an paternal inheritances o Dyfed an Seisyllwg in 930, oustit the Aberffraw dynasty frae Gwynedd an Powys an then codified Welsh law in the 940s. Maredudd ab Owain (r. 986–99) o Deheubarth (Hywel's grandson) wad, (again) temporarily oust the Aberffraw line frae control o Gwynedd an Powys. Maredudd's great-grandson (throu his dauchter Princess Angharad) Gruffydd ap Llywelyn (r. 1039–63) wad conquer his cousins' realms frae his base in Powys, an even extend his authority intae Ingland. Owain Gwynedd (1100–70) o the Aberffraw line wis the first Welsh ruler tae uise the teetle princeps Wallensium (prince o the Welsh), a teetle o substance gien his veectory on the Berwyn Moontains, accordin tae John Davies. Owain Gwynedd's grandson Llywelyn Fawr (the Great, 1173–1240), wrestit concessions throu the Magna Carta in 1215 an receivin the fealty o ither Welsh lairds in 1216 at the cooncil at Aberdyfi, acame the first Prince o Wales. His grandson Llywelyn ap Gruffudd an aa secured the recogneetion o the title Prince o Wales frae Henry III wi the Treaty o Montgomery in 1267. Later houiver, a succession o disputes, includin the impreesonment o Llywelyn's wife Eleanor, dauchter o Simon de Montfort, culminatit in the first invasion bi Keeng Edward I o Ingland. As a result o militar defeat, the Treaty o Aberconwy exactit Llywelyn's fealty tae Ingland in 1277. Peace wis short leeved an, wi the 1282 Edwardian conquest, the rule o the Welsh princes permanently endit. Wi Llywelyn's daith an his brither prince Dafydd's execution, the few remeenin Welsh lairds did homage for thair launds tae Edward I. Llywelyn's heid wis cairied throu Lunnon on a spear; his baby dauchter Gwenllian wis locked in the priory at Sempringham, whaur she remeened till her daith 54 years later. Tae help mainteen his dominance, Edward constructit a series o great stane castles: Beaumaris, Caernarfon an Conwy. His son, the futur Keeng Edward II o Ingland, wis born at Edward's new castle at Caernarfon in 1284. He acame the first Inglis Prince o Wales, nae as an infant, but in 1301. Efter the failed revolt in 1294–95 o Madog ap Llywelyn – wha styled himsel Prince o Wales in the Penmachno Document – an the risin o Llywelyn Bren (1316), the next major uprisin wis that led bi Owain Glyndŵr , against Henry IV o Ingland. In 1404, Owain wis reputitly crouned Prince o Wales in the presence o emissaries frae Fraunce, Spain an Scotland. Glyndŵr went on tae haud pairlamentar assemblies at several Welsh touns, includin Machynlleth. But the rebellion failed, an Owain went intae hidin in 1412; peace wis essentially restored in Wales bi 1415. Awtho the Statute o Rhuddlan in 1284 providit the constitutional basis for post-conquest government o the Principality o north Wales frae 1284 till 1536, thare wis na formal Union till 1536. Shortly efterwarts Welsh law, that haed conteena'd tae be uised in Wales efter the Norman conquest, wis fully replaced bi Inglis law, unner whit wad acome kent as the Act o Union. Prior tae the Breetish Industrial Revolution, that saw a rapid economic expansion atween 1750 an 1850, thare war signs o smaw-scale industries scaitert ootthrou Wales. Thir ranged frae industries connectit tae agricultur, sic as millin an the manufacture o ooen textiles, throu tae minin an quarrelin. Till the Industrial Revolution, Wales haed ayeweys been reliant on its agricultural ootput for its walth an employment an the earliest industrial businesses war smaw scale an localised in manner. In the late 18t century, slate quarrelin begoud tae expand rapidly, maist notably in north Wales. The Penrhyn Quarry, appent in 1770 bi Richard Pennant, wis employin 15,000 men bi the late 19t century, an alang wi Dinorwic Quarry, it dominatit the Welsh slate tred. As the sooth Wales coalfield wis exploitit, mainly in the upland valleys aroond Aberdare an later the Rhondda, the ports o Swansea, Cairdiff an later Penarth, growed intae warld exporters ofcoal an, wi them, cam a population buim. Historian Kenneth Morgan descrived Wales on the even o the First Warld War as a "relatively placid, sel-confident an successfu naition". Ootput frae the coalfields continued tae increase, wi the Rhondda Valley recordin a peak o 9.6 million tons o coal extractit in 1913. The ootbreak o the First Warld War (1914–1918) saw Wales send 272,924 Welshmen in the war, representin 21.5% o the male population. The twa maist notable battles o the War tae include Welsh forces war thae at Mametz Wood on the Somme an the Battle o Passchendaele. The first quarter o the 20t century an aa saw a shift in the poleetical laundscape o Wales. Syne 1865, the Leeberal Pairty haed held a pairlamentar majority in Wales an, follaein the general election o 1906, anerly ane non-Leeberal Member o Pairlament, Keir Hardie o Merthyr Tydfil, representit a Welsh constituency at Wastmeenster. Yet bi 1906, industrial dissension an poleetical militancy haed began tae unnermine Leeberal consensus in the soothren coalfields. In 1916, David Lloyd George acame the first Welshman tae acome Prime Meenister o Breetain whan he wis made heid o the 1916 coaleetion govrenment. In December 1918, Lloyd George wis re-electit at the heid o a Conservative-dominated coaleetion govrenment, an his puir haundlin o the 1919 coalminers' strike wis a key factor in destroyin support for the Leeberal pairty in sooth Wales. The industrial wirkers o Wales begoud shiftin taewart a new poleetical organisation, established bi Hardie an ithers tae ensur an electit representation for the wirkin cless, that is nou cried the Labour Pairty. Whan in 1908 the Miners' Federation o Great Breetain acame affiliatit tae the Labour Pairty, the fower Labour candidates sponsored bi miners war aw electit as MPs. Bi 1922, hauf o the Welsh seats at Wastmeenster war held bi Labour politeecians—the stairt o a Labour hegemony that wad dominate Wales intae the 21st century. Efter economic growthe in the first twa decades o the 20t century, Wales' staple industries endured a prolanged slump frae the early 1920s tae the late 1930s, leadin tae widespread unemployment an poverty in the sooth Wales valleys. For the first time in centuries, the population o Wales went intae decline. The Seicont Warld War (1939–1945) saw Welsh servicemen an weemen fecht in aw the major theatres o war, wi some 15,000 o them killed. Bombin raids brocht major loss o life as the German Air Force tairgetit the docks at Swansea, Cairdiff an Pembroke. The 20t century saw a revival in Welsh naitional feelin. Plaid Cymru wis formed in 1925, seekin greater autonomy or unthirldom frae the rest o the UK. The term "Ingland an Wales" acame common for descrivin the aurie tae that Inglis law applee'd, an in 1955 Cairdiff wis proclaimed as caipital ceety o Wales. Cymdeithas yr Iaith Gymraeg (The Welsh Leid Society) wis formed in 1962, in response tae lang-held fears that the leid micht suin dee oot. Efter watter projects caused tensions, naitionalist feelins growed. At a bi-election in 1966, Gwynfor Evans wan the pairlamentar seat o Carmarthen, Plaid Cymru's first Pairlamentar seat. In the first referendum, in 1979, the Welsh electorate votit on the creaution o an assembly for Wales, but thare wis a lairge majority for the "na" vote. Houiver in 1997 a referendum on the same issue siccared a "ay", awtho bi a verra narrae majority. The Naitional Assembly for Wales (Cynulliad Cenedlaethol Cymru) wis set up in 1999 (unner the Govrenment o Wales Act 1998) an haes the pouer tae determine hou the central govrenment budget for Wales is spent an admeenistert, awtho the UK pairlament reserves the richt tae set leemits on the pouers o the Welsh Assembly. Wales is a kintra that is pairt o the Unitit Kinrick. Constitutionally, the UK is a de jure unitar state, its pairlament an govrenment in Wastmeenster. In the Hoose o Commons – the lawer hoose o the UK govrenment – Wales is representit bi 40 MPs (oot o 650) frae Welsh constituencies. Labour MPs haud 25 o the 40 seats, the Conservatives eleiven, Plaid Cymru three an the Leeberal Democrats haud ane seat. Referendums held in Wales an Scotland in 1997 chuise tae establish a form o sel-govrenment in baith kintras. In Wales, the consequent process o devolution begoud wi the Govrenment o Wales Act 1998, that creautit the Naitional Assembly for Wales (Welsh: Cynulliad Cenedlaethol Cymru). Labour remained the lairgest Assembly pairty follaein the 2007 election, winnin 26 o the 60 seats. Haein insufficient support tae form a govrenment, the Labour Pairty entered intae the 'Ane Wales' agreement wi Plaid Cymru, formin a coaleetion, wi the Labour leader as First Meenister. Carwyn Jones haes been First Meenister an leader o Welsh Labour syne Rhodri Morgan retired frae office in December 2009, efter nine years an ten months as First Meenister. The twinty auries o responsibeelity devolved tae the Welsh Govrenment, kent as "subjects", include agricultur, economic development, eddication, heal, hoosin, local govrenment, social services, tourism, transport an the Welsh leid. On its creaution in 1999, the Naitional Assembly for Wales haed na primar legislative pouers. Wales is an aa a distinct UK electoral region o the European Union representit bi fower Members o the European Pairlament. For the purposes o local govrenment, Wales haes been dividit intae 22 cooncil auries syne 1996. Thir "principal auries" are responsible for the provision o aw local govrenment services, includin eddication, social wark, environment an roads services. Wales is a generally moontainous kintra on the wastren side o central soothren Great Breetain. It is aboot 170 miles (270 km) north–sooth an 60 miles (97 km) east–wast. The oft-quotit 'size o Wales' is aboot 20,779 km2 (8,023 sq mi). Wales is mairchit bi Ingland tae the east an bi sea in aw ither directions: the Erse Sea tae the north an wast, St George's Channel an the Celtic Sea tae the soothwast an the Bristol Channel tae the sooth. Wales haes aboot 1,680 miles (2,700 km) o coastline (alang the mean heich watter merk), includin the mainland, Anglesey an Holyhead. Ower 50 islands lee aff the Welsh mainland; the lairgest bein Anglesey, in the north-wast. Muckle o Wales' diverse laundscape is moontainous, pairticularly in the north an central regions. The moontains war shapit during the last ice age, the Devensian glaciation. 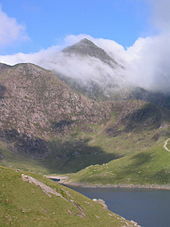 The heichest moontains in Wales are in Snowdonia (Eryri), o that five are ower 1,000 m (3,300 ft). The heichest o thir is Snowdon (Yr Wyddfa), at 1,085 m (3,560 ft). The Seiven Wunners o Wales is a leet in doggerel verse o seiven geographic an cultural laundmerks in Wales probably componed in the late 18t century unner the influence o tourism frae Ingland. Aw the "wonders" are in north Wales: Snowdon (the heichest moontain), the Gresford bells (the peal o bells in the medieval kirk o All Saints at Gresford), the Llangollen brig (biggit in 1347 ower the River Dee), St Winefride's Well (a pilgrimage steid at Holywell) in Flintshire, the Wrexham (Wrecsam) steeple (16t-century touer o St Giles' Church, Wrexham), the Overton yew trees (auncient yew trees in the kirkyaird o St. Mary's at Overton-on-Dee) an Pistyll Rhaeadr – a taw watterfaw, at 240 ft (73 m). Wales lies within the north temperate zone. It haes a cheengeable, maritime climate an is ane o the weetest kintras in Europe. Welsh wather is eften cloody, weet an windy, wi wairm simmers an mild winters. Rainfaw patterns shaw signeeficant variation. The forder wast, the heicher the expectit rainfaw; up tae 40% mair. At law elevations, rain is unpredictable at ony time o year, awtho the shouers tend tae be shorter in simmer. The uplands o Wales hae maist rain, normally mair nor 50 days o rain during the winter months (December tae Februar), fawin tae aroond 35 rainy days during the simmer months (Juin tae August). Ower the last 250 years, Wales haes been transformed first frae a predominantly agricultural kintra tae an industrial, an nou a post-industrial economy. Syne the Seicont Warld War, the service sector haes come tae accoont for the majority o jobs, a featur teepifyin maist advanced economies. Frae the middle o the 19t century till the post-war era, the minin an export o coal wis a dominant industrie. Accordin tae Professor Phil Williams, the Great Depression "devastatit Wales", north an sooth, acause o its "owerwhelmin dependence on coal an steel". Acause o puir-quality sile, muckle o Wales is unsuitable for crap-growin an fermstockin fermin haes tradeetionally been the focus o agricultur. The Welsh laundscape (pertectit bi three naitional parks) an 45 Blue Flag saunds, as well as the unique cultur o Wales, attract lairge nummers o tourists, wha play an especially vital role in the economy o rural auries. The poond sterling is the siller uised in Wales. The population o Wales doobled frae 587,000 in 1801 tae 1,163,000 in 1851 an haed reached 2,421,000 bi 1911. Maist o the increase cam in the coal minin destricts, especially Glamorganshire, which grew frae 71,000 in 1801 tae 232,000 in 1851 an 1,122,000 in 1911. Pairt o this increase can be attributit tae the demografic transeetion seen in maist industrialisin kintras in the Industrial Revolution, as daith rates dropped an birth rates remeened steady. Houever, thare wis an aa lairge-scale migration intae Wales in the Industrial Revolution. The Inglis war the maist numerous group, but thare war an aa conseederable nummers o Erse an smawer nummers o ither ethnic groups, includin Italians, wha migratit tae South Wales. Wales an aa received immigration frae various pairts o the Breetish Commonweel o Naitions in the 20t century, an African-Caribbean an Asian commonties add tae the ethno-cultural mix, pairteecularly in urban Wales. Mony o thir sel-identify as Welsh. The 2011 census shawed Wales' population tae be 3,063,456, the heichest in its history. In 2011, 27% (837,000) o the tot population o Wales war nae born in Wales, includin 636,000 fowk (21% o the tot population o Wales) wha war born in Ingland. Accordin tae the 2001 census, 96% o the population wis White Breetish, an 2.1% non-white (mainly o Breetish Asian oreegin). Maist non-white groups war concentratit in Cardiff, Newport an Swansea. The tot fertility rate (TFR) in Wales wis 1.90 in 2011, that is ablo the replacement rate o 2.1. Baith Inglis an Welsh are conseedert offeecial leids o Wales, wi Welsh forder recognised in law as haein "offeecial status". Inglis is spoken bi awmaist aw fowk in Wales an is the main leid in maist o the kintra. The lairgest releegion in Wales is Christianity, wi 57.6% o the population descrivin themsels as Christian in the 2011 census. The seicont lairgest attendin faith in Wales is Roman Catholic, wi an estimatit 43,000 adherents. Islam is the lairgest non-Christian releegion in Wales, wi mair nor 24,000 (0.8%) reportit Muslims in the 2011 census. Wales haes a distinctive cultur includin its awn leid, customs, halidays an muisic. Wales haes three UNESCO Warld Heritage Steids: The Castles an Toun wals o Keeng Edward I in Gwynedd; Pontcysyllte Aqueduct; an the Blaenavon Industrial Laundscape. Wales can claim ane o the auldest unbreuken leeterar tradeetions in Europe. The leeterar tradeetion o Wales stretches back tae the saxt century an includes Geoffrey o Monmouth an Gerald o Wales, regairdit bi historian John Davies as amang the finest Laitin authors o the Middle Ages. In 1588 William Morgan acame the first person tae translate the Bible intae Welsh, frae Greek an Ebreu. 1885 saw the publication o Rhys Lewis bi Daniel Owen, creeditit as the first novelle written in the Welsh leid. Mony warks o Celtic airt hae been foond in Wales. Maist Welsh pented left Wales tae dae thair wirk. Wales is eften referred tae as "the laund o sang", an is notable for its hairpists, male choirs, an solo airtists. Tradeetional instruments o Wales include telyn deires (triple hairp), fiddle, crwth, pibgorn (hornpipe) an ither instruments. The Banner o Wales incorporates the reid draigon (Y Ddraig Goch) o Prince Cadwalader alang wi the Tudor colours o green an white. It wis uised bi Henry VII at the Battle o Bosworth in 1485 efter that it wis cairied in state tae St. Paul's Cathedral. The reid draigon wis then includit in the Tudor ryal airms tae signifee thair Welsh strynd. It wis offeecially recognised as the Welsh naitional banner in 1959. The daffodil an the leek are an aa seembols o Wales. The Prince o Wales' heraldic badge is an aa whiles uised tae seembolise Wales. The badge, kent as the Prince o Wales's feathers, conseests o three white feathers emerging frae a gowd coronet. "Hen Wlad fy Nhadau" (Scots: Laund o My Faithers) is the Naitional Anthem o Wales, an is played at events sic as fitbaa or rugby matches involvin the Wales naitional team as weel as the openin o the Welsh Assembly an ither offeecial occasions. In sport, rugby union is seen as a seembol o Welsh identity an an expression o naitional consciousness. ↑ 7.0 7.1 "The Countries of the UK". statistics.gov.uk. Retrieved 10 October 2008. ↑ Myres, Natalie; Rootsi, Siiri; Lin, Alice A; Järve, Mari; King, Roy J; Kutuev, Ildus; Cabrera, Vicente M; Khusnutdinova, Elza K; Pshenichnov, Andrey; Yunusbayev, Bayazit; Balanovsky, Oleg; Balanovska, Elena; Rudan, Pavao; Baldovic, Marian; Herrera, Rene J; Chiaroni, Jacques; Di Cristofaro, Julie; Villems, Richard; Kivisild, Toomas; Underhill, Peter A (2010). "A major Y-chromosome haplogroup R1b Holocene effect in Central and Western Europe – see discussion results at end of article, the distribution maps and the supplementary tables". European Journal of Human Genetics. 19 (1): 95–101. doi:10.1038/ejhg.2010.146. PMC 3039512  . PMID 20736979. ↑ "Disestablishment, Cymru Fydd and Plaid Cymru". National Library of Wales. llgc.org.uk. Retrieved 25 November 2010. ↑ "Cymdeithas yr Iaith Gymraeg's first protest, 1963". Gathering the Jewels. gtj.org.uk. Retrieved 25 November 2010. ↑ 51.0 51.1 Powys, Betsan (12 January 2010). "The long Welsh walk to devolution". BBC News website. BBC. Retrieved 26 September 2010. ↑ "Making laws for Wales". Naitional Assembly for Wales website. Naitional Assembly for Wales. 2010. Retrieved 6 October 2010. ↑ "Schedule 5 to the Government of Wales Act 2006 (as amended)". Naitional Assembly for Wales website. Naitional Assembly for Wales. 2006. Retrieved 6 October 2010. ↑ "Your Members in the European Parliament". European Parliament. Retrieved 8 June 2015. ↑ "Local Authorities". Welsh Govrenment. Retrieved 9 September 2010. ↑ UK 2005 – The Official Yearbook of the United Kingdom of Great Britain and Northern Ireland (PDF). Office for National Statistics. 2004. pp. 2 & 30. ISBN 0-11-621738-3. Retrieved 10 February 2012. ↑ "Geography: About Wales". Visit Wales website. Welsh Govrenment. 2010. Retrieved 3 October 2010. ↑ "Size of Wales project". Size of Wales. Retrieved 10 February 2012. ↑ "England and Wales". European Land Information Service. Retrieved 2 October 2010. ↑ Parliamentary Debates, House of Commons, 16 December 1974, column 317W. ↑ See Meic Stephens (ed. ), Companion to Welsh Literature. The doggerel verse wis componed in Inglis, probably for the benefit o veesitors frae athort Offa's Dyke. ↑ "Seven Wonders of Wales". Visit Flintshire. Retrieved 3 April 2016. ↑ 74.0 74.1 "Met Office: Regional Climate: Wales". Met Office website. Met Office. 2010. Retrieved 26 September 2010. ↑ "Weather at Cardiff Airport (CWL):Weather and Climate in Cardiff Area, Wales, U". Airports guides website. TravelSmart Ltd. 2010. Retrieved 26 September 2010. ↑ Williams, Professor Phil (September 2003). The psychology of distance: Wales: one nation. Papurau Gregynog. 3. Cardiff: Institute of Welsh Affairs (published 2003). p. 31. ISBN 1-86057-066-6. ↑ "Tourism – Sector Overview Wales". GO Wales website. GO Wales. Retrieved 7 September 2010. ↑ LSJ Services [Wales] Ltd. "Population ''therhondda.co.uk''. Retrieved 9 May 2006". Therhondda.co.uk. Archived frae the oreeginal on 20 May 2008. Retrieved 17 October 2009. ↑ "BBC Wales — History — Themes — Italian immigration". BBC. Retrieved 17 October 2009. ↑ "A Statistical Focus on Ethnicity in Wales" (PDF). National Assembly for Wales. 2004. p. 1. Retrieved 10 February 2012. ↑ 97.0 97.1 "Statistical bulletin: 2011 Census: Key Statistics for Wales, March 2011". Office for National Statistics. 11 December 2012. Retrieved 11 December 2012. ↑ "Faith in Wales, Counting for Communities" (PDF). 2008. p. 21. Retrieved 6 September 2010. ↑ "Celtic Art in Iron Age Wales, NMOW". Amgueddfa Cymru – National Museum Wales. Retrieved 19 June 2010. ↑ 108.0 108.1 "The dragon and war". BBC Cymru Wales website. BBC. 2010. Archived frae the oreeginal on 28 January 2011. Retrieved 2 October 2010. ↑ "Welsh flag, 23 February 1959 vol 600 cc121-2W". Hansard. Pairlament o the Unitit Kinrick. Retrieved 3 October 2010. ↑ "Welsh National Anthem: History: About Wales". Visit Wales website. Welsh Govrenment. 2010. Retrieved 21 October 2010. Wikimedia Commons haes media relatit tae Wales. This page wis last eeditit on 17 Juin 2018, at 08:11.